We will never know for sure, but this might have been the story that got us deported in May. 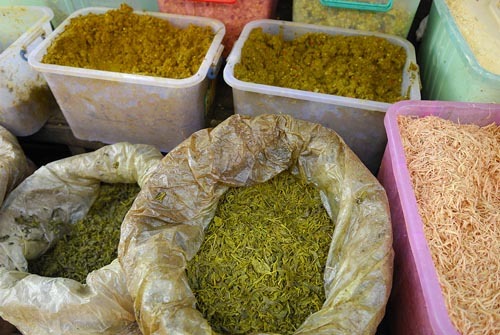 We had planned to visit a market selling laphet thote ingredients—dried beans and peas—but we got the boot the night before our visit. Families traditionally store laphet thote ingredients in lacquerware trays such as the above. This display belongs to U Zaw Hein, whose family has owned and operated the Ah Yee Taung pickled tea leaf business in Mandalay for more than a century. Ingredients include three styles of tea leaf; a variety of crispy seeds, beans and nuts; and an insect that lives in spirulina ponds. 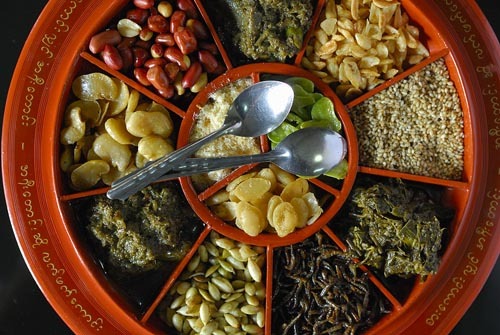 Laphet thote is a welcoming dish, served to guests with tea and betel. Below: large sacks of tea leaves for sale at a market in central Mandalay. Deported for a recipe? That’s a distinction! Well, thanks for this, it’s marvelous that Burmese cuisine should get an audience. (I just wish their chickens didn’t all die of old age before being served up). Our copy of AFAR arrived yesterday, with your article and Jerry’s photos – congratulations! The laphet thote sounds tasty. Love the photo of the novice monk.